As the Mars Society's Mars Desert Research Station (MDRS) begins its 16th year of analog studies in southern Utah, we look back with pride on the people who have supported the station in the past, those who have been and are now working on their dreams through their professional position in the space sector. There are plenty of opportunities to participate at MDRS other than as a crew member. If you would like to get involved in any capacity or if any of the volunteer positions listed below interest you, please contact us. We would be delighted to have you join us. Remember, many volunteer opportunities rely on a virtual presence, so you can be part of the team no matter where you are in the world. Unless otherwise specified, please contact Shannon Rupert at: srupert@marssociety.org for further information or how to volunteer. Mission Support volunteers are truly the backbone of the MDRS crew experience. We support crew members from the application process through their rotation at the Utah station and beyond. We are currently looking for the following Mission Support personnel. Solar Power: We are looking for several people with experience and/or understanding of solar systems to assist our contractor with the construction of our new solar system. One must be willing to work in hot and dusty environmental conditions. Hab “Place-Lift”: Yes, it’s happening. A total facelift for the MDRS station! We need carpenters, dry-wallers, finishers, painters, plumbers, and DIY experts to help with that major project. New stateroom design, new stairs, reconfigured bathroom facilities, you name it, we are doing it. New Science Lab: We have a new science building that will be completed prior to the refit, however the interior work will need to be finished. The lab is mainly for geology and microbiology so we could use some expert advise on layout, etc. New Greenhouse: We are looking for people who would like to get our greenhouse up and running for the new field season. Come out in September and plant for the crews. We need people to start the plants the crews will maintain during the field season and others to get our aquaponics system operational. There are two ways to participate in this refit. 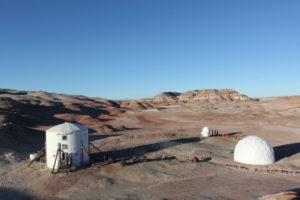 One is to drive to MDRS on your own and be responsible for your own lodging unless there is space available at the Hab. You may also camp on site. In this case, we welcome you anytime during the two-week refit. The second way to attend is to travel to Grand Junction, CO and come out with a group of work party folks in our rental car. This plan requires a one-week commitment and you will be housed at MDRS. We feed everyone. Refits are structured so that volunteers will have time to spend exploring the area surrounding MDRS. Professionals in a needed field (carpentry, plumbing, etc.) may be reimbursed for travel costs and/or paid, depending on what we need. Let us know if you are offering your services and require payment. Mission Support scholarships are available. Come out and help before you serve as a crew member and we will waive part or all of crew fee. Finally, please revisit this page in September for volunteer opportunities during the upcoming 2016-17 MDRS field season.